L.A. 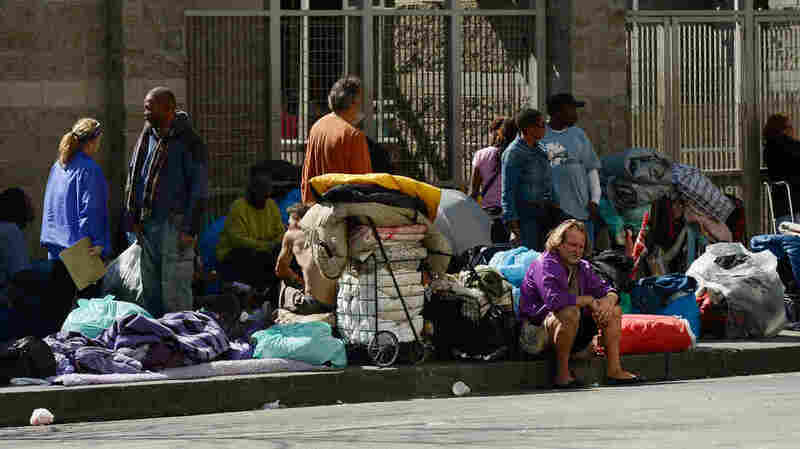 Puts Chronically Homeless In The Front Of Housing Line Homeless-services providers in Los Angeles County are gathering data on the homeless population and ranking people by vulnerability. The goal is to get the most in need into permanent housing quickly. The "housing first" approach has been used in cities nationwide, but it has its critics, even among other advocates. Homeless people rest on a public sidewalk early this year in downtown skid row area of Los Angeles. The United Way of Greater Los Angeles is attempting to end "chronic homelessness" by 2016 with a model that identifies the neediest cases and provides them with permanent homes. An initiative in Los Angeles County is trying to help the homeless by first connecting them with a place to live. The "housing first" model has been used in cities across the country in recent years to combat long-term homelessness. In L.A. County, the Home For Good project focuses on those who are most at risk, aiming to end chronic homelessness in the area by 2016. Homeless-services providers are gathering information about the population and ranking individuals' vulnerability. Then, the goal is to move the most in need into permanent housing, quickly. Research has shown that the "housing first" model can save money by keeping the chronically homeless out of emergency rooms, jails and shelters. The approach has its critics, though, even among advocates. They argue that devoting so many resources to this subpopulation isn't helping to reduce overall homelessness. AmeriCorps members Robert Harper and Charles Miller make daily rounds on Los Angeles' Skid Row, to seek out the most vulnerable people living on the streets. They work with other agencies to find them a permanent place to live — and they try to do it fast, Harper says. "A person is out here about to die and you tell them, 'Sign a waitlist and wait for a year'? Come on, now," he says. "We're known as the 90-day people." On a recent day, they visit Billy Ray West, who had agreed to meet them at a nearby fast food joint. West, 53, is an alcoholic and has lived on the streets for more than 30 years. If they can help him track down his birth certificate, he'll be under a roof within the next few months, no strings attached. West is what these agencies would call "chronically homeless:" people who have been living on the streets for an extended period of time and may suffer from a disabling condition. They make up a quarter of L.A. County's homeless population but use three-quarters of its homeless resources, according to the United Way. Before meeting Harper and Miller, West says, he hadn't received much help on Skid Row. But he says that's on him. "You know, I've just really been too damn lazy, just sitting ... around doing nothing. You know, just drinking all day," he says. "That's basically my fault, because I wasn't doing nothing to help myself." Hazel Lopez is part of a team organized by United Way of Greater Los Angeles to help reach their 2016 goal. Before this system, she says, case managers often weren't sure that they were helping the neediest people. "I think that now, when we provide someone with a unit, it's safe to say that that person is the most vulnerable in our community," she says. When Home For Good case managers meet someone on the streets, they use a standard survey to collect information: medical history, substance abuse issues, income, usual whereabouts. Each client is then assigned a vulnerability score. All of that information is loaded into a database that all participating agencies can access and update. Instead of competing for resources, she says, they are all — quite literally — on the same page. "We're all working with the same pool of clients, and we're all working towards this one goal," she says. "We just want to move forward, you know, as a team." But the strategy has its skeptics. Andy Bales, CEO of Skid Row's Union Rescue Mission, says that as resources have shifted to the chronically homeless, the vast majority of people experiencing homelessness has been left out in the cold. "It takes all strategies to end homelessness, not just one simple silver bullet," he says. Homelessness in Los Angeles has actually increased since Home For Good launched in 2010, he says. Even the number of chronically homeless individuals went up in the past two years. Home For Good says it plans to expand its Skid Row operation to help all of L.A. County's 12,000 chronically homeless. But with only about 1,000 permanent housing units to go around each year, that's going to take some work.